(Left to right) Kneeling: Randy Marshall, Jacynth Serrano Rodriguez, Victoria C. Flanagan; First Row: Mary Flinn, Brandie Gray, Amanda Sue Goemmer, Sophia Wiltrout, Annie Persons, Angel Williams, Gregory Donovan; Second Row: Caitlin Etherton, Allie Hoback, Bennett Winters, Sarah Mohrman, Kelly-Jayne McGlynn; Third Row: Emily Block, Caitlin Mitchell, Ariell Branson, Scott Selden; Fourth Row: Caleb Stacy, Meredith Lewanowicz, Scott Bugher, Thomas C. Burgess; Not Pictured: M.A. Keller. Blackbird, founded in 2002 as a joint venture of the Virginia Commonwealth University Department of English and the former New Virginia Review, Inc., benefits from the contributions of graduate and undergraduate student interns, as well as from MA and MFA Graduate Assistants from the VCU Department of English. 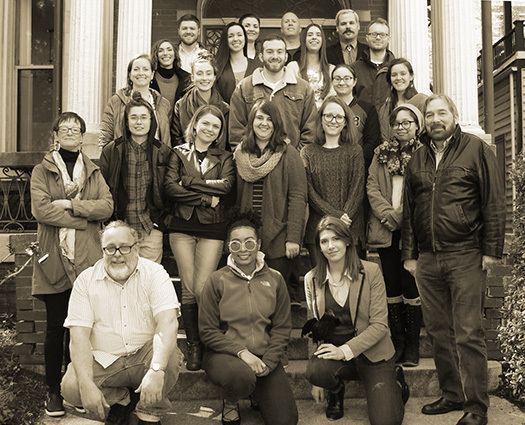 Students from the interdisciplinary PhD program in Media, Art, and Text (MATX) have also worked with us in past years, as have community volunteers and MFA alumni. We are grateful for everyone's contributions. Each year, Blackbird awards the coveted lead associate editor position to a second–year VCU MFA graduate student; to qualify, the student must already have been awarded a graduate fellowship and must have worked as an intern for the journal. The lead associate editor staffs the Blackbird office in the historic Anderson House, and is at the center of all the journal’s activities, working to coordinate communication between literary and production editors, as well as between the editors and contributors. Staff listings are by categories. Gregory Donovan, senior editor, is the author of the poetry collections Torn from the Sun (Red Hen Press, 2015), long-listed for the Julie Suk Award, and Calling His Children Home (University of Missouri Press, 1993), which won the Devins Award for Poetry. His poetry, essays, translations, and fiction have been published in The Kenyon Review, The Southern Review, New England Review, TriQuarterly, diode, Crazyhorse, Hayden’s Ferry Review, Gulf Coast, Copper Nickel, and many other journals. His work has also appeared in several anthologies, including Common Wealth: Contemporary Poets of Virginia (University of Virginia Press, 2003). Among other awards for his writing, he is the recipient of the Robert Penn Warren Award from New England Writers as well as grants from the Virginia Commission for the Arts and fellowships from the Ucross Foundation and the Virginia Center for the Creative Arts. Donovan has served as a visiting writer and guest faculty for a number of summer conferences and low-residency programs, such as the Bread Loaf Writers’ Conference, the Chautauqua Institution Writers’ Center, the River Pretty Writers Retreat, the VCFA Postgraduate Writers’ Conference, and The University of Tampa MFA program. With the writer/director Michele Poulos, he is a producer of A Late Style of Fire, the feature-length documentary on the life and work of the late Larry Levis. Donovan is a founding faculty member of Virginia Commonwealth University’s graduate creative writing program. Mary Flinn, senior editor, began her tenure as the director of New Virgina Review, Inc. in 1985. She is the coeditor, with George Garrett, of Elvis in Oz: New Stories and Poems from the Hollins Creative Writing Program (University of Virginia Press, 1992) and facilitated the editing of The Gazer Within (University of Michigan Press, 2001), a collection of essays by Larry Levis. Flinn served as the poetry and fiction editor of 64 and the editor of New Virginia Review. She has participated on numerous editors’ panels, served as a judge for literature fellowships from various arts councils, and been a review panelist for the National Endowment for the Arts and the Virginia Commission for the Arts. Flinn won the inaugural Theresa Pollak Award for Words from Richmond Magazine, and Style Weekly recognized her as one of their 2016 Richmond Women in the Arts. M.A. Keller, senior online editor, is a technologist, web coordinator, and writing instructor for Virginia Commonwealth University’s Department of English. His poetry has appeared in The Southern Review, New Virginia Review, Runes, and elsewhere. Keller is the author of a chapter, “Meghan Sapnar’s ‘Car Wash’ as a New Media Sonnet,” in RAW (Reading and Writing) New Media (Hampton Press, 2010). His work centers on electronic writing, issues of materiality and multimodal writing, and how to define, support, and teach online publishing and new media. He has taught poetry and advanced writing workshops, as well as courses in hypertext and new media. He publishes the visual blog, Abaculi, and is the editor of The Abaculi Project. Keller earned an MFA in creative writing from Virginia Commonwealth University. Randy Marshall, senior literary editor and photo editor, edited, along with Mary Flinn, Andrew Miller, and John Venable, The Gazer Within (University of Michigan Press, 2001). His poetry, essays, and reviews have appeared or are forthcoming in Richmond Arts Magazine, New South, cream city review, diode, Gulf Coast and Blackbird. Marshall earned his MFA in poetry from Virginia Commonwealth University, where he currently serves as an adjunct instructor, teaching poetry writing and advanced composition. Marshall is also a writing instructor at the Visual Arts Center of Richmond, where he holds workshops in beginning poetry, multi-genre writing, and the lyric essay. Victoria C. Flanagan, lead associate editor, is a second-year MFA student in poetry and nonfiction at Virginia Commonwealth University. She is the recipient of the 2017 Thomas B. Gay Graduate Poetry Award and the Catherine and Joan Byrne Poetry Prize from the Academy of American Poets, and her reviews have appeared in Blackbird. Flanagan holds a BA in English and BFA in creative writing from the University of North Carolina Wilmington. Jake Branigan, lead associate editor emeritus, is a third-year MFA student in fiction at Virginia Commonwealth University. He earned a BA in English and a Master of Arts in teaching from James Madison University. Chelsea Gillenwater, book review editor, is a page designer and copyeditor for the Bristol Herald Courier and a contributor at Heart Beings. Her fiction and reviews have appeared in Blackbird and Philologia. She earned a BA in English and communication from Virginia Tech and an MFA in fiction from Virginia Commonwealth University, where she served as the 2014–2015 lead associate editor for Blackbird. Ross Losapio, book review editor, served as the 2011–2012 lead associate editor for Blackbird. His poems and reviews have appeared in Copper Nickel, The Emerson Review, the minnesota review, Naugatuck River Review, Rattle, Verse Wisconsin, and Blackbird, among other journals. He earned a BA in writing and English from Loyola University Maryland and an MFA in poetry from Virginia Commonwealth University. Scott Bugher, assistant literary editor and copyeditor, is a third-year MFA student in poetry at Virginia Commonwealth University. His work has appeared in The Baltimore Review, The Rumpus, Hobart, and elsewhere. He is the founder and former editor-in-chief of Split Lip Press. Caitlin Etherton, lead audio editor, is a first-year MFA student in poetry and creative nonfiction at Virginia Commonwealth University. She earned a BA in English with a minor in religion from Emory University. Caleb Stacy, lead pagebuilder and production intern, is a second-year MFA student in poetry at Virginia Commonwealth University. He earned a BA in English from West Virginia University. Sophia Wiltrout, lead audio editor, is a first-year MFA student in fiction at Virginia Commonwealth University. She earned a BA in English and creative writing from George Washington University. Ariell Branson, literary intern and pagebuilder, is a junior undergraduate student at Virginia Commonwealth University. She will graduate in the spring of 2018 with a BA in English and a minor in philosophy of law. Her short fiction has appeared in Apex Magazine. Thomas C. Burgess, literary intern and audio editor, is a senior undergraduate student at Virginia Commonwealth University. He will graduate in the fall of 2017 with a BA in English and a minor in religious studies. His poetry has appeared in Teeth Dreams Magazine, and he is a community DJ for the University of Richmond’s radio station, WDCE. Amanda Goemmer, literary intern and pagebuilder, is a first-year MFA student in fiction at Virginia Commonwealth University. She has worked as an assistant editor for The Oklahoma Review, and her fiction has appeared in Burningword and The Gold Mine. She earned a BA in English from Cameron University. Brandie Gray, literary intern and copyeditor, is a first-year MFA student in poetry at Virginia Commonwealth University. She earned a BA in English and creative writing with a minor in communication studies from Hollins University. Allie Hoback, literary intern and copyeditor, is a junior undergraduate student at Virginia Commonwealth University. She will graduate in the spring of 2018 with a BA in English and a minor in anthropology. Meredith Lewanowicz, literary intern and copyeditor, is a senior undergraduate student at Virginia Commonwealth University. She will graduate in the spring of 2017 with a BA in English and a minor in British studies. Kelly-Jayne McGlynn, literary intern and copyeditor, is a senior undergraduate student at Virginia Commonwealth University. She will graduate in the spring of 2017 with BAs in English and philosophy. Caitlin Mitchell, literary intern and audio editor, is a junior undergraduate student at Virginia Commonwealth University. She will graduate in 2018 with a BA in English and a minor in creative writing. Sarah Mohrman, literary intern and audio editor, is a senior undergraduate student at Virginia Commonwealth University. She will graduate in the spring of 2017 with a BA in English. Jacynth Serrano Rodriguez, literary intern and photo editor, is a sophomore undergraduate student at Virginia Commonwealth University. She will graduate in the spring of 2019 with a BA in English and minors in art history and media studies. Scott Selden, literary intern and copyeditor, is a first-year MFA student in fiction at Virginia Commonwealth University. His fiction has appeared in The Offbeat, The Critical Pass Review, and Akashic Books’s “Mondays Are Murder” flash fiction series. He has worked as an intern and assistant editor for Virginia Living magazine. Angel Williams, literary intern and pagebuilder, is a senior undergraduate student at Virginia Commonwealth University. She will graduate in the fall of 2017 with a BA in English and a minor in religious studies. Bennett Winters, literary intern, copyeditor, and pagebuilder, is a first-year MFA student in fiction at Virginia Commonwealth University. He earned a BA in English from Cornell University. Annie Persons, volunteer copyeditor, is a first-year MFA student in poetry at Virginia Commonwealth University. She earned a BA in English with a minor in creative writing from Washington and Lee University, where she served as a managing editor for Shenandoah. to all the editors, staff members, interns, and volunteers who made Blackbird, volume 16, number 1 possible. Special thanks to Victoria C. Flanagan, our lead associate editor, for keeping us all focused on this big effort, and for bringing the work of the contributors and the Blackbird team into fruition. Thanks to Sophia Wiltrout and Caitlin Etherton for their audio capturing and editing, and for leading the media team; to Emily Block for taking charge of the copyediting team; to Randy Marshall for directing the photo editing team; to Caleb Stacy for leading the pagebuilding team. Thanks to Chelsea Gillenwater for her continued support of Blackbird. Thanks to Randy Marshall, Amanda Goemmer, Brandie Gray, Scott Selden, and Bennett Winters for their extensive work with submissions and for leading the reading groups. Thanks to Mary Flinn and Randy Marshall for contributing the foreword text, and thanks to everyone who wrote metatext for this issue. And to all others—manuscript readers, pagebuilders, audio editors, photo editors, transcribers, and copyeditors, our sincere appreciation.